This past weekend, Portland's Oregon Convention Center played host to the most recent Galactic Qualifiers for Star Wars™: Destiny. The tables were packed, the battles hard-fought, and for the pair of players who went undefeated, the rewards were as sweet as could be. Of course, they earned stacks of Prize Credits to cash in for custom prizes at the Prize Wall, but more than this, they earned invitations to the 2018 Star Wars: Destiny World Championships! So as we look forward to the next Galactic Qualifiers in Seattle, who are these players, what heroes—or villains—helped carry them to victory, and what can you learn from their decisions that might help you find success in your own battles? There were two Galactic Qualifier tournaments held in Portland—one Trilogy and one Standard—and the action began with Saturday's Trilogy Qualifier. While players were all still experimenting with the new charaters and tactics from the Boba Fett Starter Set, the Luke Skywalker Starter Set, and the Legacies Booster Packs, we saw just one player go undefeated on the day—Andrew Heintz. Andrew's deck relied heavily upon the new indirect damage mechanic from Legacies, and he told us that his indirect damage caught a lot of his opponents by surprise. "I think indirect damage has significant value," he said, "especially in the end-game." 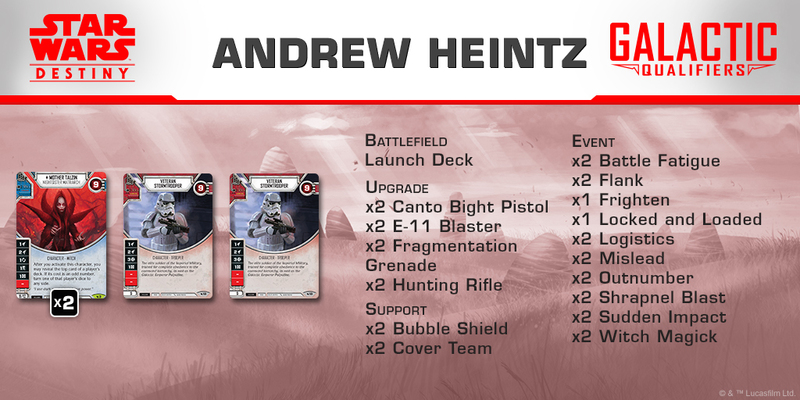 Apart from its focus on indirect damage, Andrew's deck brought a lot of health to the table—twenty-seven points of health between his three characters—which bought him time to pile on the damage before tilting games irrevocably in his favor with big plays from cards like Sudden Impact. With the full force of the Star Wars: Destiny dice and card pools behind it, Sunday's Galactic Qualifier was a battlefield erupting in blaster fire and shrapnel. At the end of the day, only one player managed to navigate the tides of battle and go undefeated. 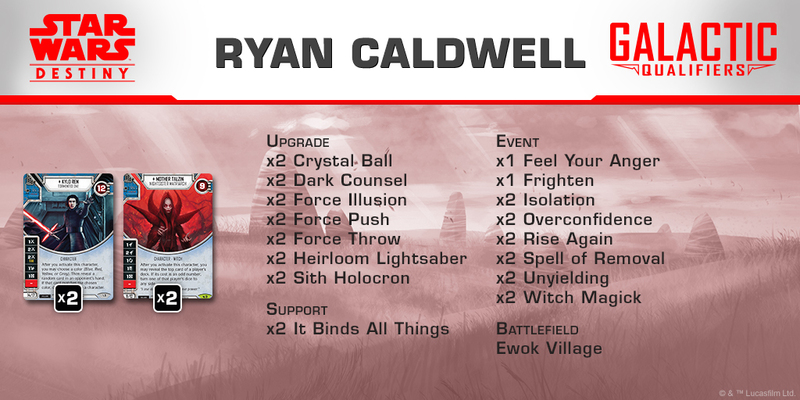 Relying upon a combination of Kylo Ren's dark side mastery and Mother Talzin's witch magick, Ryan Caldwell earned himself an invitation to the World Championships in May. Ryan's deck shows that you don't need to lean heavily on legendary cards to play at the top levels in Star Wars: Destiny. Instead, as Ryan said, his deck was based on "characters I own and characters I like." Loaded with healing from cards like Witch Magick and Rise Again, along with the damage prevention from Force Illusion, Ryan's deck proved highly durable, but was nearly caught off-guard by a hero discard strategy featuring Rose, Jar Jar Binks, and Yoda. With the duels from Protland now behind us, we can turn our attention to the blast of Star Wars: Destiny Galactic Qualifiers headed our way in March. We have events lined up in Seattle, Washington; Austin, Texas; Schaumburg, Illinois; and Houston, Texas. Each of these events offers another shot at some of the hottest custom cards and playmats that you'll find anywhere—along with a chance to qualify for the World Championships in May. What will we see at these events? If the results at Portland are any indication, we'll see plenty of Mother Talzin and her Witch Magick, and we may see more hero discard strategies as well. Both Andrew and Ryan claimed that their toughest match-ups were against these hero "mill" decks. In the end, though, there's really only one way to know what heroes or villains will claim the day—by taking matters into your own hands. Take the time to dig deep into Legacies, build your best deck, head to one of these upcoming Galactic Qualifiers, and win!